Bottas (left) and Vettel during day one of 2017 testing. With new regulation comes the hope of a change in the pecking order in the standings – particularly if they have been dominated by one outfit for a few years. 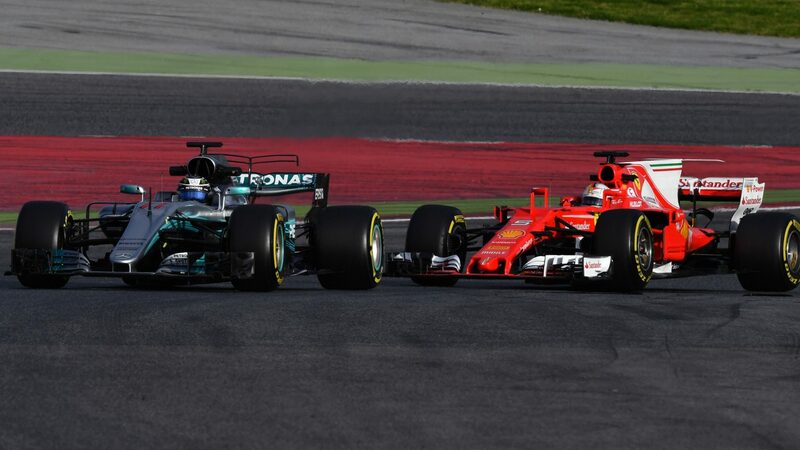 And, indeed, ahead of the 2017 season the Mercedes’ challenger does not look as strong as its older sisters. It started as usual, with the Silver Arrows topping the time sheet on the first testing day, with the newly signed Valtteri Bottas. The Finn made the most of the opportunity to acclimatise himself properly in the team, racking up the highest number of laps during the two weeks. But the first surprise of the pre-season came as soon as day two, when Ferrari’s Kimi Raikkonen lapped the fastest time of the session… and went onto doing the same on day four also. Albeit Mercedes took the laurels on days three and six, their place on the pedestal was truly shaken as Ferrari continued to take the lead on two more days, indisputably dominating the two-week session. The Scuderia returned to the track after a dire season, when – instead of the promised charge for victory – the team seemed to had taken a step backwards, to complete the year behind their closest rivals of the new turbo-era, Red Bull. But if their Circuit de Catalunya performance is anything to go by, 2017 might just be the year for the Prancing Horse to jump back to the top of the table – somewhere it has been looking to return since 2007, when the Champion title was snatched by no other than Raikkonen himself. The Finn was on a truly winning form both testing weeks, having topped the time sheets on three of the eight days, and completed the testing as the fastest driver overall, clocking the only sub-1m19s lap of the pre-season. His 1m18.634s on super-soft tyres was 0.7 seconds faster than the next best lap delivered by his team-mate Sebastian Vettel (who also took the lead on one of the testing days) – and the Finn claimed there was still more speed to be extracted from his SF70H. “If we want, we can go faster but that’s not the purpose of the test,” Raikkonen told Autosport. “Obviously you try to go as fast as you can whatever we decided to do. “I think they have been doing a fantastic job and there is more to come from them,” the Brit said. “I think their pace here this week has really been spectacular and still Red Bull are there. Another team to look out for is Williams, whose returning lead driver Felipe Massa clocked two fastest times in both winter sessions, as well as the fifth fastest time overall, behind Bottas and Hamilton in third and fourth respectively. Not only that – Mercedes’ technical boss Paddy Lowe has made a surprise return to Williams – his first ever F1 team – to head its engineering operation. Having contributed to 158 race wins, seven drivers’ titles and five constructors’ titles, Lowe’s move promises more excitement from the Grove team in the coming months. Back to testing, and just 0.01s behind Massa was Max Verstappen in the already mentioned Red Bull who – despite struggling with their power unit (see below) – gave an indication of being in the contention for wins this year. So, the pre-season would suggest we might finally experience some battles at the very front of the grid between the these four outfits – but how believable are these results? Nothing’s to be taken at face value during testing, and what the drivers say can be trusted even less. So while Bottas and Hamilton claim there’s more work to be done to unleash the W08’s full potential, and predict “a tough start to the season”, some inside sources suggest they had been running through testing with a conservative setting on their engine, and therefore potentially harnessing an additional 70 bhp of speed for actual racing. So, the question is: who was bluffing in the end? 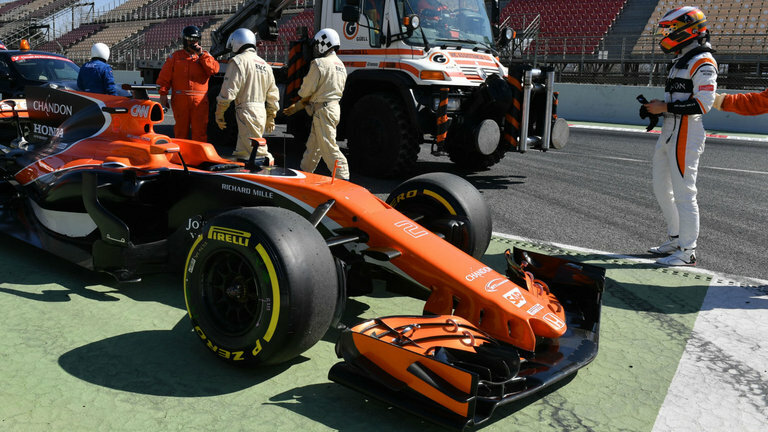 Stoffel Vandoorne looks on his twice broken-down McLaren. The new orange livery and three years’ experience under their belts did nothing for McLaren Honda’s fortunes in 2017. After an awful start to the first test with an electrical failure on day one, the remainder of the sessions continued in a similar manner, and ended in four red flags on the last day – two each for either of its drivers. The multitude of problems resulted in the lowest number of laps of all teams – even less than Sauber’s Pascal Wehrlein, who missed out on the whole first week in Barcelona; while the underperforming engine – dubbed by the team’s veteran driver Fernando Alonso as having “no power and no reliability” put the outfit 2.7sec off the pre-season leader’s pace. McLaren’s new full-time signing, Stoffel Vandoorne, believes there are potential problems the team is yet to discover… while the team’s racing director Eric Boullier said the issues put a “maximum” strain on their relationship with Honda. No wonder than that the British outfit has been investigating an option to source their engines from Mercedes if Honda do not up their game – seemingly a mutual agreement between the engine supplier and the team who realise lack of performance will impact negatively on the partnership’s finances anyway. Regardless of his squad’s dark-tinted future, Alonso is not hanging the cap on his career just yet, claiming a bad 2017 will not drive him out of F1. “I feel confident that this year we will be competitive – I don’t know at which point in the year, but we will be competitive and I want to win races, I want to be on the podium” he said. “And if everything goes in the wrong direction, I will attack next year, you know. Ricciardo’s Red Bull is recovered into the pits on day one of testing. The new season already proves challenging for Renault – not only as a works outfit, but also the engine manufacturer. Early problems with the power unit’s Energy Recovery System affected all of the teams powered by the French company during the pre-season, placing them in the bottom of milage stats, and only ahead of McLaren. “We were expecting to encounter some difficulties – we had those difficulties that materialised,” said Renault F1 managing director Cyril Abiteboul. “But the good news is that we are not doing that for nothing, meaning that the performance is there when we are trying to extract it. And, indeed, despite the low lap count, the Renault-powered cars didn’t do so badly in terms of timings, with Red Bull’s Versatppen, Toro Rosso’s Carlos Sainz Jr., Renault’s new signing Nico Hulkenberg and Red Bull’s Daniel Ricciardo all making the list of the top 10 fastest drivers. 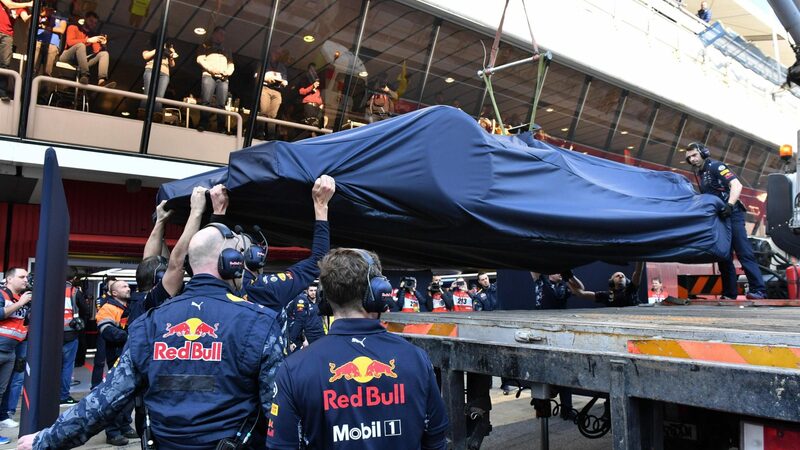 Tipped as contenders for the title this year, Red Bull will certainly hope the engine in the RB13 will deliver, despite the early pre-season reliability issues that put an unfortunate spin on their “Unlucky 13″ marketing campaign. The team’s principal Christian Horner as well as its drivers are “content” with their winter preparations and believe in a good start to the season – but how about the rest of Renault-powered cars? Hulkenberg – who has just made the move to the works team after three years with Force India – believes scoring points will be difficult this season, due to the performance gap to the top four outfits, identified in the testing. “I think Renault is better placed than last year,” he said. “The team moved closer to the midfield. “Points will be difficult as I think four teams are clearly in front. The winter testing seemed to confirm there will be little left in terms of points for Haas and Sauber also, with the American team’s owner Gunther Steiner saying the top three teams (Mercedes, Ferrari and Red Bull) could be 1.5sec ahead of the rest of the field. And what about the other remaining team, that falls somewhere in the middle…? Running on Mercedes power has already proved a blessing for Force India who have kept their position in the F1 mid-to-top filed for the last few years. In this winter testing they maintained the same form, with Sergio Perez and newbie Esteban Ocon coming as 10. and 11. fastest overall. But it wasn’t their pre-season form that caused an uproar these last few days – and rather, the whole new look of their chassis. 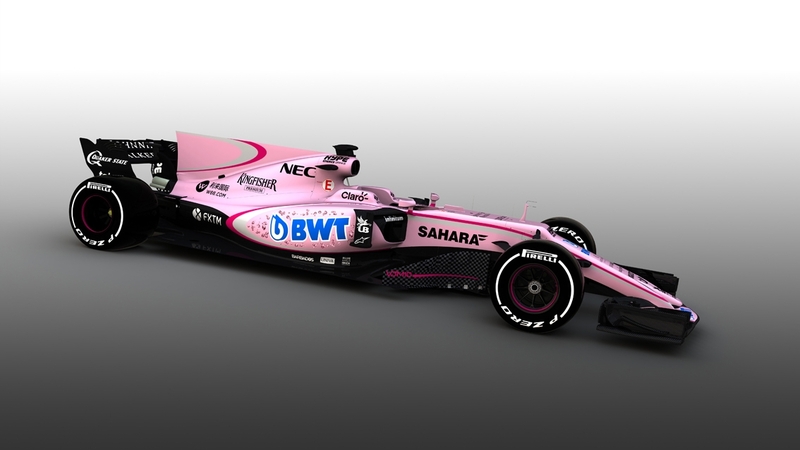 After securing a partnership with a major new sponsor, BWT, the team swapped its silver and black livery (which it still used in Barcelona) for bubblegum pink. “The arrival of BWT in Formula One is huge news and represents one of the most significant partnerships in our ten year history. It’s a sign of how far we have come as a team with our strong results and completes a solid commercial performance over the winter,” said the team’s MD, Vijay Mallya.